Understanding the Passion is obviously critical for us, but St. John’s method of presenting it — lengthy, multi-chapter discourse makes it easy to lose for forest for the trees. Christ has completed over the course of three years of ministry seven major signs. He, the Light of the World, has revealed himself over and over. Now is the time for the Light to leave the world and, in doing so, overcome the Prince of the World once and for all. It is important, though, for understanding to remember that these were actual, historical events and that their meaning for us is shaped by who did what when. This is a chart from the Agape handout for next Saturday detailing these events up to Chapter 14. Where did the man who would become the first of the servants of the servants of Christ sit at the Last Supper? In the servant’s chair, of course…. 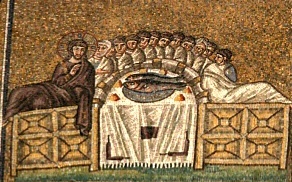 Question: How does Jesus visually demonstrate this teaching at the Last Supper banquet table? See John 13:21-22 and the plan of the triclinium in the Charts section. I agree with the Agape materials — Christ is teaching us about the least being the greatest — so he puts St. John (the youngest) in the place of honor and puts St. Peter in the servant’s spot. Judas had to have been close by. Once again, the details really make the Gospels come alive! Let me pose a question in this post. What is the connection between the ritual washing of the Apostles’ feet and Jesus’ first public sign? As always, Jesus takes Old Covenant ritual and, by bringing its true meaning out, transforms it. Question: What comment did Jesus make to Simon the Pharisee on the lack of his hospitality when he criticized the loving devotion of the sinful woman who washed Jesus’ feet with her tears? See Luke 7:44. Answer: Then he turned to the woman and said to Simon, ‘You see this woman? I came into your house, and you poured no water over my feet, but she has poured out her tears over my feet and wiped them away with her hair. After eating the roasted lamb that had been sacrificed earlier at the Temple that day. To take the place of one of the ritual hand washings gives the foot washing an aspect of ritual purification. Question: Many Catholic scholars believe the foot washing ritual was an ordination ceremony for the Apostles. There is evidence to support this interpretation in Old Covenant purification rites. Jesus washes the feet of His Apostles in this significant ritual and later during the meal, their hands will also be ritually washed. Is there an Old Covenant ritual purification that Jesus’ symbolic foot washing and the ritual hand washing of the meal may be linked to? See Exodus 30:17-21; what is the significance of this passage? Answer: In the ritual of purification before entering the Sanctuary, Yahweh commanded that the priests ritually cleanse their hands and feet. This ritual of purification was commanded by Yahweh for the first High Priest Aaron, the brother of Moses and for Aaron sons. Whenever the priests came near the sacrificial altar to minister the sacrifice offered to Yahweh or when they entered the Holy Place (see Exodus 30:20 and Leviticus 8:6), they were commanded to wash their hands and feet, even though they were already clean. Question: Knowing what will take place at the end of this meal, what connection might there be between the command for the priests to wash their hand and feet before offering sacrifice to Yahweh and the miracle that will take place that night when Jesus holds Himself in His hands in the first Eucharistic offering? Answer: It is possible this action is the establishment of the Sacrament of Holy Orders and in the ordination of the New Covenant priesthood. In the foot washing ritual Jesus was not only instructing His ministers to preach the Gospel of salvation in humility, but His actions can also be seen as the anointing of the new priesthood of the New Covenant Church. His symbolic purification of the Apostles takes place before the celebration of the first Eucharistic sacrifice. For other passages on hand and foot washing see Genesis 19:2; 24:32; 43:24; Exodus 30:19-21; 40:31-32; Leviticus 8:6; 15:11; Judges 19:21; 1 Samuel 25:41; 2 Samuel 11:8; Song 5:3; Matthew 15:2; 27:24; Mark 7:3; Luke 7:38, 44; 11:38; 1 Timothy 5:10. In any event, it is the role reversal that so shocks Simon-Peter that he protests that he cannot allow his Lord to perform this menial and degrading task. While the common priesthood of the faithful is exercised by the unfolding of baptismal grace –—a life of faith, hope, and charity, a life according to the Spirit—, the ministerial priesthood is at the service of the common priesthood. The relationship between this and Holy Orders is unclear — I haven’t been able to find an explicit statement —but it shows the link between service and the ministerial priesthood or, the inverted triangle of the servants of the servants of God. Holy Orders — How Did We Get Here From There? This is a summary that was prepared by the Diocese of Fort Worth. It provides a quick overview which I thought might be interesting. 1. Summary to 100 A. D.
a. Only one priest – Jesus Christ; his ministry, service. c. Ordained priest – a special sign of Christ’s priesthood and a call to serve all Believer in living out Jesus’ ministry. d. First priestly leaders (Bishops) recognized by their outstanding service and guided community in learning Jesus’ teachings, doing good works and celebrating the Eucharist. e. At first there were different types of Church government but before too long the monarchical form – as for a king – prevailed. f. Bishop looked to talents of other Christian men and women – preaching, teaching healing, and prophesying – to help him in his ministry. g. Two groups became recognized assistants: Priests to act as advisors, deacons to work with the daily needs of the people. a. All the individual tasks of ministry had an ordination rite to give “authority” for the job. b. Authority within the whole Church was by “collegiality,” mutual consultation and renewal. c. Bishops delegated power to priests so they could minister to the growing number of churches. d. Priest’s role as “Vicar of Christ” carried idea of special spiritual power. e. Clergy gained further power by acting as judges and counselors in government. f. Power-authority tended to overshadow as priestly ministry. 3) A life of prayer and spirituality separate from everyday world. b. Middle ages and Renaissance saw priesthood as one of several levels of power. Bishops, not priests, had power to confirm and ordain. c. Clergy took over total responsibility for worship and devotion – no role for people. d. Priests tended to form an elite class with political and church power. e. Council of Trent tried to limit Bishops’ power and to insure better education for priests. 4. Seventeen and eighteenth centuries the aspect of secular and political power in the priesthood began to disappear. The clergy became pastors, “sacristy” priests, caring for the church and ceremonies of worship, holding office hours in the sacristy, and seldom leaving the confines of the church except to visit the sick. The continued to be “separated” men, held to be wise in the ways of God, but sharing little with the lives of the people. a. With the resources of the Vatican library at hand, scholars begin to examine the history and development of the priesthood. b. Catholic theologians began to examine the signs of Christ’s priesthood in their own ministries and those of other faiths. 6. Vatican II to the present. a. Vatican II’s renewal of Church traditions affirms the role of Bishop as fullness of priesthood. b. The relationship of priests to their bishop in a spirit of collegiality is emphasized. c. The office of deacon is restored as a permanent order in the Church’s sacramental ministry. d. Restoration of the essential place of Scripture in the life and worship of the Church brings about a new emphasis on the role of preaching in the life and ministry of all ordained ministers. e. The Council’s vision of the Church as the People of God infuses its understanding of ordained ministry with a more communitarian spirit. Clergy become more free to utilize the talents and experience of laity in the exercise of their ministry of leadership and service. Here’s a quick one: CatholicBlogs.com is a directory of Catholic blogs. Are you looking for a topic? Seek and ye shall find! In November 2007, George Misulia, a Catholic layman who lives in Mt. Airy Maryland, was lying in bed, recovering from fractured vertebrae suffered during a bad accident and wondering what he might do to support Catholics defending America in the armed services. There are some 1.5 million Catholics in the armed forces of the United States today; their 300 chaplains are stretched very thin across a vast number of deployment areas and overseas bases. Some soldiers, sailors, airmen, and Marines go for months on end without seeing a chaplain or being able to participate fully in the sacramental life of the Church — often at moments of great spiritual vulnerability when their lives are on the line. Units that don’t have their chaplain are often served by lay leaders trained in what are called “Catholic Lay Services in the Absence of a Priest.” Bible studies and other forms of paraliturgical worship are also used when a chaplain is unavailable. And so, with the help of a few friends, Operation Let the Fire Fall was born. The first “FireBox” unit was sent to Thule Air Force Base in Greenland in September 2008. Catholics at Thule see a priest perhaps twice a year. But with the FireBox equipment supplementing the Catholic Lay Service, the Catholics at Thule began gathering weekly for prayer. Since that modest beginning at the top of the world, Operation Let the Fire Fall has deployed FireBox units and supporting materials around the world, to Turkey, Iraq, Afghanistan, Egypt, and other sits. Chaplains in all branches of the service have eagerly embraced Operation Let the Fire Fall, as have Archbishop Timothy Broglio of the Archdiocese of the Military Services and his predecessor, Archbishop Edwin O’Brien, now Archbishop of Baltimore. Operation Let the Fire Fall cannot substitute for an increase in the chaplain corps, and doesn’t pretend to do so. Its aims are modest, but nonetheless important for their modesty: given the circumstances we’ve got, which dictate that Catholics in the armed services are often deprived of a normal sacramental life, sometimes for months on end, it ought to be possible to enhance the opportunities for regular worship that can be created, both by overstretched chaplains and dedicated lay leaders. And if Operation Let the Fire Fall does that, it may help bring out of the service a rich harvest of priestly vocations, which could then reinforce the chaplain corps. Want to know more? Go to Operation Let the Fire Fall’s web site, http://www.oltff.com/. It’s a project worth learning about, following, and supporting. George Weigel is Distinguished Senior Fellow and William E. Simon Chair in Catholic Studies at the Ethics and Public Policy Center in Washington, D.C.